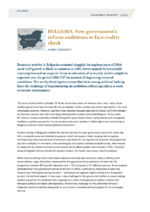 Economic activity in Bulgaria remained sluggish throughout most of 2014; weak GDP growth is likely to continue in 2015, driven mainly by household consumption and net exports. Some acceleration of economic activity might be expected over the period 2016-2017 on account of improving external conditions. The newly elected government that lacks strong political backing faces the challenge of implementing an ambitious reform agenda in a weak economic environment.